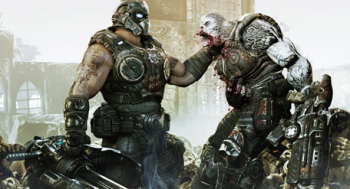 Will Clayton Carmine live or die in Gears of War 3? Well, technically, he does both. The Carmine brothers have a proud history of dying in the Gears of War games, and Clayton Carmine in will be no exception in Gears of War 3. Well, probably not, anyway. There's a chance he might survive, and Epic, keen for no one to give the game away, has gone to the trouble of crafting multiple endings to keep his fate a secret. Epic held a charity event in July of last year, where people could vote whether Clayton lived or died by buying t-shirts for their Xbox 360 avatar. Two shirts were on offer, one emblazoned with "Save Carmine," and the other sporting the slogan "Carmine Must Die." People could also buy real world versions of the shirts, either at that year's San Diego Comic-Con, or by getting them online. Whichever shirt sold best determined whether Clayton lived or died, and all the proceeds went to Child's Play. Epic's Mike Capps revealed the studio's efforts to keep the mystery an actual mystery to attendees at Gamescom. "We actually wrote both [endings] in the game," he said, "just in case the game leaked so no-one would be able to tell what happens." This may have proven a smart move, as they game did leak earlier this year. Multiple endings are pretty common in videogames, although usually they're actual, achievable endings, rather than red herrings meant to throw people off the scent. We're going to have to wait until September 20th to find out the Clayton's real fate, when Gears of War 3 comes out for Xbox 360.